I have 3 new patterns made in Oh Clementine out now…I made these quilts in March so they’ve been waiting awhile to get out of the box and onto the blog! This one was quilted by Kathy. 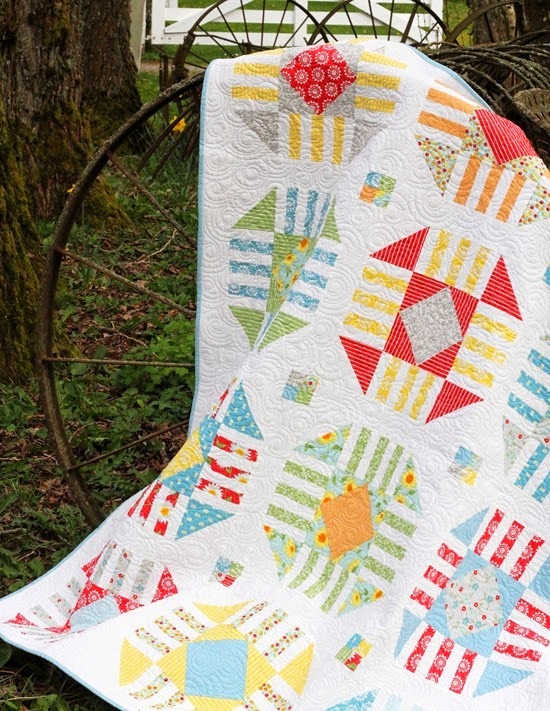 She did all of this free hand and it’s amazing…it brings the whole quilt to life. Vintage is a large block, fat quarter quilt. I’ve had this one drawn up in my notebook for years…it’s so gratifying to see it come to life! Kathy quilted this with a dense fan/swirl pattern…one of my favorite quilting patterns. The Morning Glory pattern uses a layer cake or yardage and comes together quickly. Christina did the quilting on this one with her new machine…you can really see it on the back of this quilt. The quilted petals are extra perfect. This one also comes with a simple pillow pattern. Morning Glory, Applejack, and Vintage can be found in my pattern shop here. Beautiful quilts, quilting and patterns!! Would love some scraps! Such happy quilts in happy colors! Congratulations on your new fabric line–looks beautiful. Wonderful patterns-love the desgns and fabrics!! I am just learning to quilt and would love some of these scraps to build my stash! These patterns are so cute! I would love some scraps from this pretty fabric line. Great design variety. I think I am going to use Applejack to make my next QOV quilt. My go-to QOV pattern has always been your Pow-Wow. Time to change it up! Love the fabrics, such pleasing colors, so fresh. Really like the vintage pattern. Send scraps! Love the new patterns! Would love to win some of those gorgeous scraps to add to my collection! such lovely fabrics! loving the new patterns too! Oh goodness! More patterns to keep me busy :) I love my sewing time! I feel so relaxed afterwards. Gorgeous fabric and patterns! Well done! Cannot decide which is my favorite. I love them all! I need to make a baby quilt gift. I sure would like to use some Clementine in that quilt. Thank you. OMG Love the new patterns, all of them and the new fabric as well. I would Love love love some scraps. Thanks so much for the chance !!!! Fabulous quilt patterns – and beautiful fabric line! Lovely fabric and super cute patterns as always! You're one of my favorite designers! Beautiful quilts and patterns. They all look like so much fun to make. My favorite is Morning Glory, I love the quilting on the petals. The colors in this collection are some of my favorites, great job! 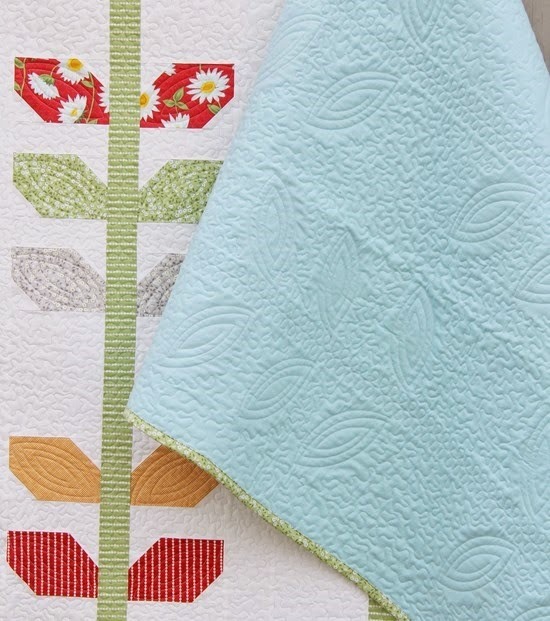 Love the Morning Glory quilt especially… they are all so pretty! Your new patterns are fantastic! And a sale?! Yippee! And of course… Sweet clementine just makes me smile! Happy day! Oh those scraps are luscious! and that Morning Glory pattern is just beee-u-te-ful! These are all great patterns. I especially love Applejack. Thanks for the chance to enhance my scraps! Love the Morning Glory pattern! I would love to win some Clementine scraps! :D My favorite of the new patterns is Morning Glory! LOVE it! Thank you! Your patterns and fabric are beautiful! Thanks for the opportunity to win scraps! What fabulous quilts really love the colour combinations. 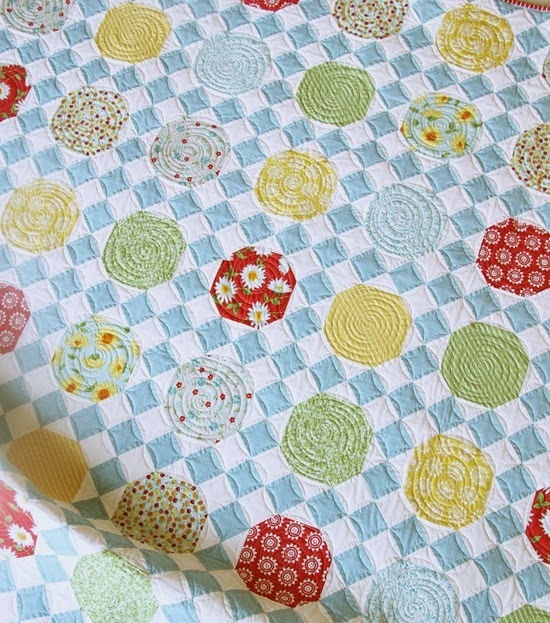 Very taken with that quilting pattern, those little blue squares just pop! Gorgeous quilts! The designs are very inspiring. The material is fabulous. I must get some! Beautiful quilts. Love everything you do! Thanks for the chance to win! Beautiful quilts! Would love the scraps. 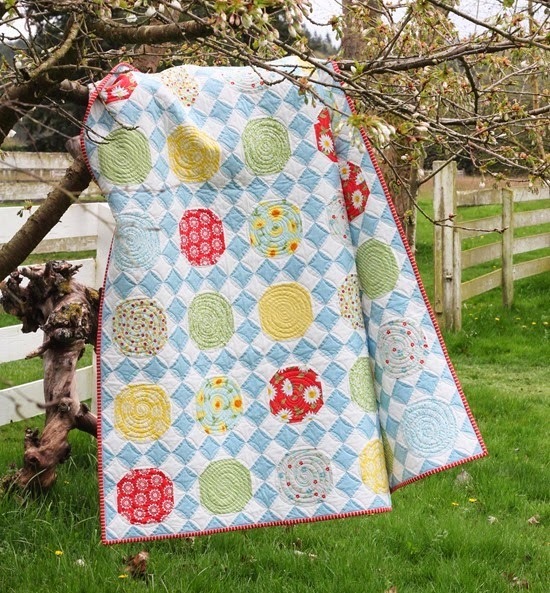 Gorgeous quilts made even lovelier by your divine Clementine fabrics! Love, love the Morning Glory pattern. It is on my list to make. The Clementine fabric is perfect with it. I agree, Christina's quilting is amazing. You are both artists. Scraps, scraps, scraps! Thank you! Oooooohhhh! Each quilt is gorgeous. Vintage is my favorite. No wait…Morning Glory is. Or…??? Each stunning! Come to me Oh Clementine! Love Your New Patterns, So Fresh Looking! I'd Love To Win Some Scraps! I adore your quilts and the fabric is in such soft colors. I will add Morning Glory to my must do list. Thanks for the chance to win bits of these gorgeous prints. I have quite a few of your patterns and today actually went to your blog to see about buying the Button Up pattern….. I'd love to win some of your scraps so I could make a quilt like yours….. I just love Vintage! Well, actually I love all three and could see them happily in my home~ I would love some scraps to play with. Congrat's on your new patterns! All three patterns are really cute and so are the scraps! Thanks so much! I love your new fabric line, and the new patterns are great! I just love your Oh Clementine fabric line! I worked on a local farm for4 years, and the prints and colors truly do capture that timeless farmyard feel! And your Vintage pattern is my favorite! I just finished Basket Case. I'd love some new scraps! Love all of the new patterns, and the fabric-sigh……….so pretty! Would love to play with your scraps. Thanks for doing this giveaway!! These are all gorgeous and all really compliment the fabric. I particularly love Applejack. And Clementine is gorgeous too – I grew up in a farming town and this reminds me so much of that in such a fun new way! Cute patterns and I love Vintage and Morning Glory. Love the fabrics your used, just perfect. Love the Morning Glory pattern and I am a scrap a holic! Wonderful Quilts! I love them all, and would love some beautiful scraps!! 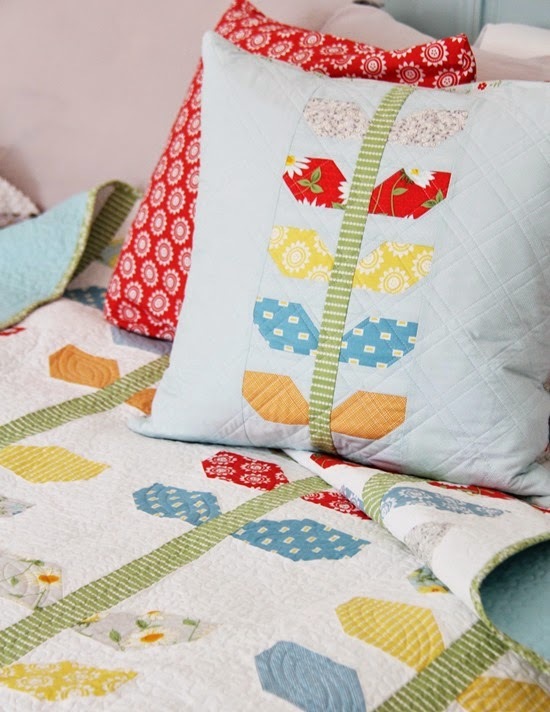 Love the Morning Glory quilt, but they all look great in this fabric/color scheme! Oh, I would love some of your scraps! 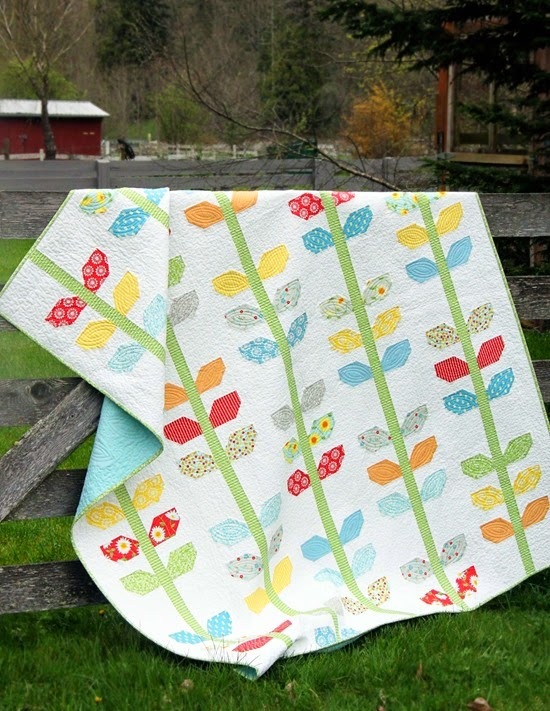 Those are darling quilts, and I LOVE the new line, especially the white sunflowers on the bright backgrounds fabrics. So pretty. Great job with the line! Gorgeous quilts!! And who wouldn't love some of those beautiful scraps! I really enjoy your quilting and your blog! Beautiful quilts as always! Would love to have some scraps please! Those are cute patterns, the vintage pattern is especially pretty in that fabric. I'd love me some scrap goodness!! Your new patterns are great! I'm working on a Pow Wow right now for my new great-nephew. So nice to have a pattern that is perfect for a boy! love the very springy fabrics! Love the new patterns and scraps, too! Thanks for the sale, too. Great fabrics, congratulations! My favorite pattern there is Vintage, what a cute block. Great patterns!!! I love Oh Clementine!! Love the blue color. Love your patterns. I've been holding on to Ziggy Baby for just the right fabric. Maybe if I'm lucky this is it! I'd gladly take some scraps: ) They make me think of summertime. : ) and great patterns!! All your patterns are fabulous! I love seeing your creations. All the possibilities for them! I would LOVE your scraps. Btw, morning glory is my favorite! Beautiful fabrics. Love the patterns. Vintage is my favorite. Thanks for sharing the scraps!! Love it all! Can't wait for this line!!! Thanks for sharing!! The quilting on the petals does make it extra special. I love it! So pretty – all three of them and the fabric! I like Vintage best. Congratulations on another beautiful line of fabrics! I would love to make something fun with scraps! All three quilts are beautiful. It is hard to pick a favorite! Love the fabric and your new patterns too!! Insure would enjoy playing with the scraps?? So pretty! I love all of your new patterns! And the fabric is beautiful. I sincerely love ALL of your patterns! Truly!! I would purchase all of them if I could get away with it! :) Your new line is so bright and cheerful, I sure hope some could make their way to my house! I'm in love with Apple Jack. Such a good versatile pattern and Vintage keeps intriguing me. I'm in the midst of remodeling a "new" old house. Some pretty fabric therapy would be wonderful!! Fabulous patterns as always! Love Morning Glory! …and ooooh would i love me some scraps! Thanks for the generous giveaway! I live these new patterns. Vintage is my favorite! Thanks for the chance to win. I love the moring glory pattern. I've been wanting I make one of these! Applejack is a buity! Nice work! Your fabric is so darling! I HAD to buy one of those fabulous patterns too! Love your new patterns! Amazing as always! I've been looking forward to seeing your new patterns, and I really like your new fabric collection. I'd love to win some scraps to get a closer look before buying yardage. Such fun quilts! Especially like the leaves. Would love, love some of your scraps. Pick me, pick me! I LOVE your new patterns, especially Morning Glory. Those scraps would probably be very happy to move in with me! What a fun giveaway! Love your work!! These are all stunning quilts. I am so excited for your new fabric line. It is the perfect blend of fun, vintage and modern. Thanks for the chance to win some! Oh my gosh! I love the fabric and I love the new patterns!! The fabrics and patterns are darling. I would love some Clementne fabrics. Thanks for all the inspiration. 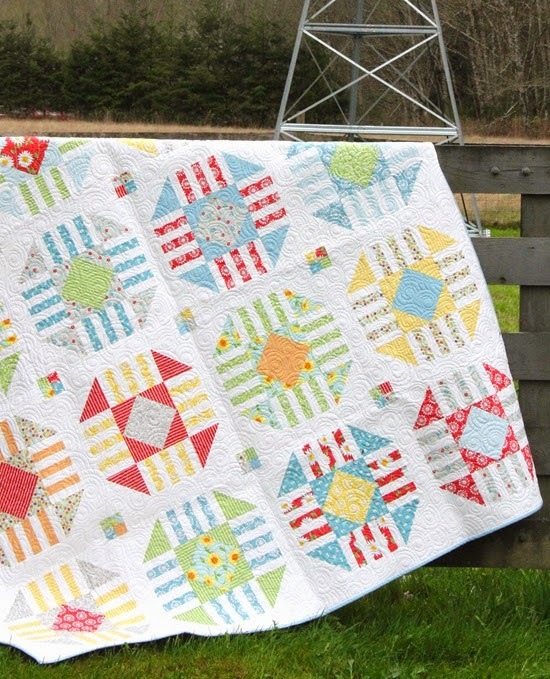 Love the bright and cheerful scraps from the beautiful quilts you have come up with. Hope I am chosen for some scraps. Love your work and designs. Would love some scraps! Great patterns! I love the fabric! Scraps are always so much fun to play with! Nice work! You do such as great job. I live just about hour or so from Kathy in Ennis, Mt. Hope some day to get a quilt to her. Love the fabric and quilts. I love your new patterns! The colors, fabrics and the quilting are very nice. Must be my thrifty nature, as I love getting new and different scraps as much as I love new yardage! This line of fabric looks so fun! I really like the sweet little 5-petal flowers on the light grayish-looking background. It's a great color combo,too. Love your patterns but a few scraps would be the bomb! I could easily see myself making at least two of these quilts. Would love to get your scraps. Love these new patterns, especially Morning Glory! Love the vintage pattern! I cannot wait to make a quilt with the oh Clementine fabrics. Such a bright and cheery line! I need more hours in my days! Beautiful quilts and fabric. Now, which one first??? I just love the colours used in your new quilts. Beautiful! I am loving the new fabric and the gorgeous quilts. Thanks for offering the pattern sale and a chance at some lovely scraps. Congrats on the new line! I would love some scraps! Yay for getting 3 more patterns up for sale. As much as I like them all, the daisy print is my favourite in the Oh Clementine range. I am not sure I can choose a favourite among the patterns. I agree that Kathy's quilting on Apple Jack as just spot on. Love scraps and would love to win some Clementine! Love your fabric line and patterns. What a great use of this fabric! Such cheerful quilts. The quilts are so pretty, love the quilting. What a nice way to get rid of scraps! The patterns are awesome and I love the fabrics. Beautiful work as always. available. It is just lovely and I love the quilts you made to show it off. I see a morning glory quilt in my future! Thanks so much for posting! Oh. Scraps! And love the Morning Glory pattern. Off to purchase. Love the bright springy colors of the fabric. The patterns are all so fun especially Morning Glory. Clementine scraps eep! I could seriously have a bolt of each and not have enough. Scraps would be a good start! Love the new patterns and the beautiful fabric. Your quilts are always so gorgeous. Your quilts are gorgeous! How much fun they will be to make! :o) Thanks for putting my name in the hat for some of those delicious scraps. Fingers crossed. Such nice work. I love your style. Your scraps would be welcomed and put to good use. Thanks for the chance. Love the quilts! I have been quilting for about 20 years and your patterns outnumber all the rest in my collection. They are cute and the directions are perfect! Love the new fabric too! me too, me too, add me to the admirers list! You already knew that though because I snapped your picture with your hubby at Market, fall 2012. About this "puzzle" thing… I tell people that making quilt tops is like making your own picture puzzle and then working it! I love to see the tops come together. When I first saw these quilts I thought, this isn't her normal LOOK, and then as I looked at them up close, I knew they were your wonderful style. Thank you for the bright new quilts and the giveaway! Loved seeing your quilts and all of the wonderful fabrics not to mention the beautiful quilting! When I come here it always makes me want to quilt : )Thanks for the chance to play! You've brought out some more lovely patterns. I've just recently purchased your 'Button-Up' Pattern and can't wait to start on it! I would love some scraps! Really, really like this fabric line…. Thanks so much!!!! I just ordered your morning glory quilt pattern – I'm thinking it would be perfect for a some day grandchild, and I would love to have some of your scraps to make it with! I love your patterns as well as your fabrics! Thanks for the discount and chance to win scraps! I love these patterns and can't wait to be able to purchase Oh Clementine. I'm definitely going to make the Morning Glory pattern for my best friend of over 50 years in this fabric. Would love to have some pieces to work with in the meantime! Thanks! Would love to exchange your scraps for my scraps….everyone has scraps! But, your scraps I am in love with. Thanks for sending them to your "fan club". Je vis en France, je ne peux donc pas participer à votre jeu mais je tenais à vous dire que votre collection clémentine est superbe. J'ai hâte de l'avoir. Vos trois quilts sont tres beaux , mon préféré est l'apple jack. Merci pour cet agréable moment et pour l'ensemble de votre travail. Love the colors! My favorite new pattern has to be Morning Glory. I have been looking for something to work on over the summer during my surgery recovery. I think I just found it! Lovely quilts! I'd love scraps too. All such lovely colours and designs, just gorgeous ! I LOVE the new patterns and the Oh Clementine fabric!!! I'm just finishing a Sugar Dish quilt and would love some new fabric to play with. Thanks for the chance to win. I started a group that makes quilts for our pediatric unit at the local hospital. Every child that is admitted gets a quilt to keep. We rely on donated fabric scraps. We'd love to have any you can share! We use several of your patterns as a basis for some quilts. Ck out my blog–www.piecedthings.blogspot.com. Love the fabric colors!! I would love some scraps!! Wonderful quilts!!! The fabrics are so happy. I would love, love, love to get some of the scraps. My 3-year-old granddaughter loves to sort through scraps and help Grammy sew. We would have so much fun with these! Your quilts are beautiful! Would love some scraps. Love the new patterns, Allison! I also love Clementine and would be happy to share in the scrappy goodness. Thanks for the giveaway! What beautiful patterns. I love scraps. Love your petal quilt – so fresh and fun. Would love some scraps. thank you for offering. So cute, such fun patterns!!! Such a pretty fabric line too! Would love to play with those beautiful scraps. I love all your patterns, Allison! Scraps! Yay! Would love some. Making a graduation quilt for my niece. I'm ordering the Morning Glory pattern today and wishing really hard for some Clementine scraps to go with it! This Clementine line totally speaks summer to me and I'm crushing on it for sure…. expecially the daisies! Always building up my stash…off to look at your patterns. Thank you! I love this fabric! It is what I call happy fabric. Your patterns are fabulous. Thanks for the chance to win some scraps of this beautiful fabric. Beautiful! I will definitely be downloading a couple new patterns. Thanks for the sale. So happy for your new line and for the chance for scraps! I always love your blog. Thanks for the chance to win your scraps. Oh such happy spring colors! Thank you for sharing! Ooh, I always welcome more scraps. And may I say that I love, Love, LOVE the Vintage pattern. So. Much. Love these new patterns! I just picked up the football pattern. My 4 year old is going to LOVE his new quilt! Thanks! Putting Applejack on my to-do list. Great work! This was a delightful email to have in my inbox! Beautiful new patterns and joyful fabrics are a marvelous combination. I am imagining Clementine scraps arriving in my mail box! Thank you! To be quite honest, I am one who usually makes my own patterns as I go so I rarely buy patterns. But…..Vintage is really calling to me. Fantastic designs. Thanks for the chance! Oh I would love some of those yummy scraps!! Love all of them…going to treat myself to a few patterns this weekend, love your work! I love the new patterns. I plan on ordering them when I get home!! thanks. Love the newest patterns! Thanks for a chance to win your scraps…what fun! I love the new patterns! I just got over a stomach bug and it was fun to see those bright and vibrant quilts jump off of the screen and brighten my morning. Thanks also for the sale! The morning glory pattern and quilting are absolutely awesome. I would love some scraps, and plan to pick up some yardage when I have the chance. Thanks for the inspiration! I've just finished two large saturated color quilts. Your breezy light-filled patterns are particularly attractive. I love the Oh Clementine pattern. OH MY GOSH!!!! I LOVE THE NEW PATTERNS!!!! You never cease to amaze! Congrats on the new line and the new patterns! I may or not may be putting in an order for those today. ;) Miss you!!! Would love me some scraps to play with. Thanks for the giveaway. Love the fabrics and new patterns. So bright and cheery! I love all of your new patterns and the new fabric line! Can't wait until it's in the stores, but I'd love to have some scraps in the meantime! I'm just now sewing up a quilt with your Wallflowers line. Love your stuff!! I'm hoping to get my hands on Clementine!! Live it!! I was wondering what had you quiet on the blog for a bit. I love seeing the creativity. Your patterns just make me happy – they remind me of summer and childhood picnics with my brother under the big oak in the backyard. Thank you for sharing them with us! And the new line is so cute! I can't decide if I like Clementine or Wallflowers more :-) Enjoy our nice PNW weather this week! Beautiful fabric and quilt!, Thank you for the chance to win. Love the new patterns and can't wait to get started on one! I really enjoy your quilts – so much fun inspiration! I have recently renewed my interest in quilting and sewing, and you have definitely given me lots of ideas! Love this fabric! And the cute quilts!! Oh I love these new patterns! I will for sure be getting a few. I love your new fabric line too! Great work! I love all of the quilts, but Vintage is my favorite. The way the blocks came together is just fantastic. Thank you for sharing and I can't wait to try it. Clementine is sooo pretty! I'd love a chance to make something wih your scraps. Thanks! Love the quilts!! I would love some scraps! I love your new patterns! I cannot wait to get my hands on some of that adorable tossed apple/orange/peach fabric. Congrats on a wonderful accomplishment! You make the best patterns! Your new fabric is gorgeous! Oh…only in the fabric world do women get excited for scraps, lol!! Love Clementine and the new patterns! I love the patterns and fabric! I'd be happy to take those scraps off your hands. I love this collection! WOW! I love them all – cannot even pick a favorite! The "curves" you have managed to get without applique are amazing! I love the morning glory pattern. I especially love Morning Glory, but all are wonderful! Thanks for the giveaway chance. that petal quilt is a must make for me and what better to start with than some of your scraps – here's hoping. Beautiful quilts! Would love some scraps! Your website/blog is always one I check and it's a great day when you've posted something new. Love your new patterns! Really like all these new patterns. Clementine really shines. Love your new fabric line! Would love to add your scraps to my ongoing string blocks. Wow, I can't wait to get my hands on Oh Clementine! Beautiful collection, I love it! I love the Morning Glory quilt and the quilting is perfect! The back is amazing as well. TFS. love love love morning glory!!! I really love your new fabric! It just says summer to me. You did a great job with these. You have such creative quilt patterns and I love to see what you come up with. Love your quilts! They are beautiful! Beautiful quilts and the colors are so fresh and clean looking. I love the fabrics. You did a great job! I am in LOVE! These are all adorable! The colors jump out to me and scream HAPPY!! Thanks for the pattern sale and chance to win some beautiful scraps! Your quilts are inspirational! I love working with scraps too! Darling patterns!! I just made my first pillow and I'm anxious to make another…..these patterns are definite possibilities! Love the new patterns and all those fabric scraps! Like the colors you used! I'll be purchasing the Morning Glory pattern! Everything is so colorful and cheerful! Scraps would be a terrific treat! Love the patterns, and love the fabric! I love the Morning Glory pattern! I've got a FQ bundle of your first line that is waiting for the right project! Really love your patterns and quilts! Love the new patterns and fabric! Thanks for a chance to win some adorable scraps!!! Sale patterns and scrappy give outs…Great post! Love everything on your site, and have worked through many of your quilts-all keepers! Love them all! And your new fabric line is delicious. Would love to have a few scraps. Thanks. Such cheery fabric choices: the patterns showcase them so sweetly. Beautiful piecing and quilting. I'd be totally blessed to receive any scraps! Lovely everything! Scraps are awesome! So sweet your sharing and I love these colors! I love your new patterns and would love to get some of those scraps! thanks for the chance! I love your new Vintage pattern. It would look good in any fabric combination. Would love some of your pretty scraps, too! Fun new stuff! LOVE the Clementine line! Alison, I love all your quilts, patterns and fabrics. Would love to win some scraps, thank you for offering. new patterns, a sale, and a scrap giveaway?! either way, i feel like a winner! thank you! new patterns, a sale, and a scrap giveaway?! i feel like a winner no matter what! thank you! Your blog makes me happy and now looking at all of the lovely fabric and quilts makes me happy. Thank you. Beautiful patterns and fabric. Fun fun !! Gorgeous patterns and the fabric colors are so pretty!! I might have to try one of these patterns! Love the morning glory pattern! Thanks for the scraps giveaway! I feel like I just took a walk through a beautiful garden. Thank you for the scraps to win!!!! You always do such simple and lovely things! So beautiful! I would love to have some scraps! Can't wait for the line to come out and the new patterns are to die for! I love the Morning Glory pattern! So cute :) thanks for the chance at some scraps! I would love some scraps! Your quilts are always beautiful, but I especially love Applejack. Congratulations on your new fabric line and patterns! Thanks for the chance to win some of your scraps, would be great to win!! oooh…pick me…pick me :) Such beautiful quilts! Confession. I just bought some of your Wallflower fabric and I LOVE it. I know, took me long enough, right?. The colors are so perfect. I can't wait for this line, I will not be waiting around so long. Thanks. Oh MY! I LOVE this fabric. I have made a promise to myself to finish all my current projects before I buy new fabric… that means I have until September to finish so I can buy this line! Well done! What a nice bundle of fabrics! Love the new quilts. I would love to make a quilt and or pillows with this fabric. They would go well in our cabin in the woods. I love the new fabric and patterns, and have the perfect project for scraps! I would love to win some of your scraps! And I need to buy that Vinage pattern! I love it! Free fabric and patterns on sale…I think I've died and gone to heaven. Great patterns and fabric line. Congratulations! Beautiful quilts! I'd love some scraps. Your quilts are great. So are your scraps (smile). I really love the petal quilt!!! Gorgeous patterns! And I Can't wait to get some of this fabric! What great quilts!! Just bought Morning Glory – so pretty. Your new patterns are beautiful! Thanks for the chance. Love love your quilts..I know what project next I am doing for my charity quilt event donation…love all your patterns….thanks for the giveaway scraps too..I can always use some for my charity quilts. What great patterns and beautiful fabrics! I'd love to have some scraps. You knocked it out of the park with this Clementine line of fabric. I am loving the large blocks of Vintage! Thanks for sharing the fabrics. Happy Mothers Day, put your feet up! I especially love your vintage pattern, and I look forward to trying it out after I finish the Suburbs quilt I'm working on :). I love seeing all of your beautiful scraps, and I'd be tickled pink to have some scraps! I love all the new Clementine patterns!! Have a wonderful time at market and I would not mind a few of your scraps!! Beautiful quilts! I especially love Morning Glory and Play Girl! Don't know how you get it all done, but so glad you do! Would love some scraps of your fabrics – thank you for the chance to win! I posted, but wanted to add something else; Happy Mother's Day! LOVE, LOVE, LOVE the new patterns, but especially the new fabric line! Such bright, fun, summery colors and prints! Beautiful patterns and beautiful fabric! Thanks for the chance to win some scraps! :) Heading over to the pattern store to grab a pattern (or 2) ! I think my favorite is the one with the leaves. Would love to win some of those pretty scraps.